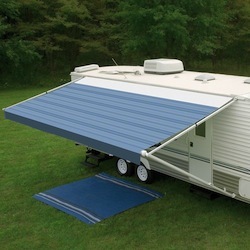 If you're looking for an affordable canopy A&E RV Awnings are a great choice. Also available are RV awning replacement parts and RV awning replacement fabric. They are made of heavy reinforced vinyl with a steel roller tube that includes a lifetime warranty against rust. Some models include anti slack hardware, auto re-tension, or electric one touch button operation. The awnings run smoothly, and the vinyl fabric will resist fading, staining. They are washable & mildew resistant. Just what you need for a nice looking long lasting RV canopy. There are several models to choice from including the Elite, Imperial, and the Sunchaser. You can position the awning in a carport or patio position. If you need an RV awning replacement or RV awning replacement fabric you should determine the size of your current canopy by measuring the length and width of your current fabric from the tube to where it attaches to your RV, but don't include the arms or the valance in your measurement. 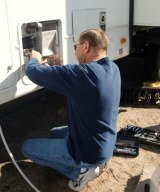 RV awning replacement parts are also available from A&E. You can find these canopies at Camping World and other RV awning replacement parts stores.